Integrated camera (!) - 0.3 megapixels (urk) at 20 fps(urkx2), comes with 4 GB SD card (ok). Photo courtesy of engadget. Opted for this one because it's the real life prototype they used. Final will have a clear magazine and blue trim. Holy carp, $75? The biggest complaint I've been receiving is that is just too much $$$ for a camera that isn't even a single megapixel. Furthermore, even if it is for kids (which it is), that's a lot for an 8 year old's toy who either has a mobile device of some sort or some other camera in this day and age. Even if it is integrated, that price is so darn high against other tech toys with better resolution. Regardless of the blaster hitting 90' (the Elite line originally touted 75' ranges) I can't see telling anyone to pay for the camera AND blaster when the camera is of such low quality. Engadget's piece also has a video, and.... well, I hope the camera gets an improvement from this prototype to the final version. The flywheels and camera each require 4 AA batteries, so there's an additional cost right there. Also, the proximity of the camera to the motors. The engadget video illustrates it perfectly: "VRRRRRRRRRRRRRRRRRRRRRRRRRRRRRRRRRRRRRRRRRRRRRRRR" is what I heard. Otherwise, the aesthetics and power boost (hopefully) are the better parts I can see about this blaster. While I can't advocate strapping an expensive iPhone or iPod Touch to the top of your blaster (personally, I use a GoPro, but that's me. Yes, maybe the camera will provide a tactical advantage cornering and yes, the camera integrated into the shell is more streamline, but a Rapidstrike is considerably less and full auto. If you need practice with trigger control, then this is more your style unless you would rather get a Stryfe. So I'm ambivalent about this blaster. I want to love the way it looks, but I don't know if that's enough for me. For $75 I could buy a Rapidstrike or Stryfe and extra darts. 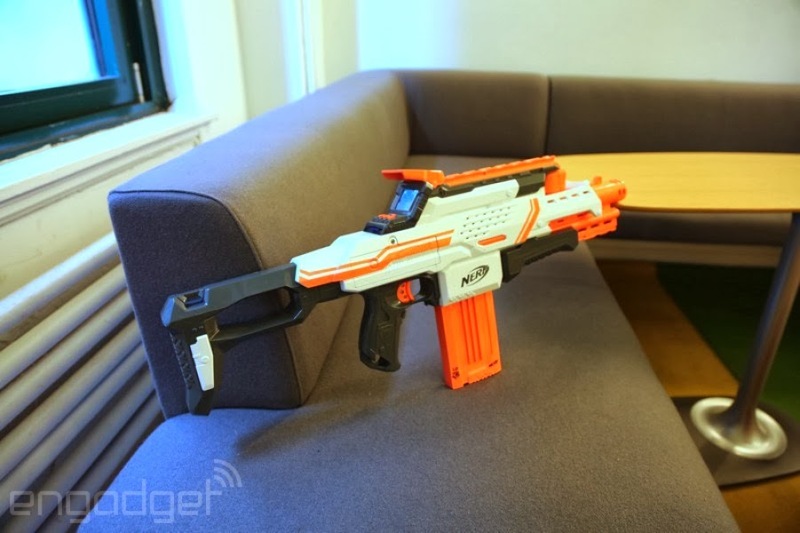 I can remove whatever camera I'm using to put on other blasters or for a project unrelated to Nerf. But for the Nerf Cam? Thumb middle of the road until the final version. Hopefully this will be available at New York Toy Fair, and I'll get a better look then.